How the LORD has turned circumstances completely around for Ruth and Naomi! Boaz married Ruth, God gave her conception, and she bore a son to him. By marrying Boaz, Ruth has now entered into the lineage of Jesus, becoming the great grandmother of none other than King David himself. Naomi, as her mother-in-law, is also blessed and shares the honor with Ruth. In Part 1 we talked about the ways to study Ruth. We have discussed all of them except the last one: Escatologically which deals with what will happen in the end times. We are living in those days! Particularly this last chapter of Ruth there are pictures of events that are happening now or that will happen at this time in history, the last days before Jesus calls for us. It is clear that there is a timeline of events both for the end times and into Jesus’ millennial reign. At the end of this beautiful love story, the Holy Spirit has a hidden message for us. Let’s continue our study and see what He has to say. Ruth 4: 14-17 “14 Then the women said to Naomi, “Blessed be the Lord, who has not left you this day without a close relative; and may his name be famous in Israel! 15 And may he be to you a restorer of life and a nourisher of your old age; for your daughter-in-law, who loves you, who is better to you than seven sons, has borne him.” 16 Then Naomi took the child and laid him on her bosom, and became a nurse to him. 17 Also the neighbor women gave him a name, saying, “There is a son born to Naomi.” And they called his name Obed. He is the father of Jesse, the father of David. Ruth is a picture of the Church. As a Gentile and a Moabitess, like us she was cut off from God and from the blessings of Israel. The Law excluded her as it excluded us. We would all have been forever under God’s curse if not for His marvelous Grace. Enter Boaz, a picture of Jesus, who spread his mantle (Tallit) over her, redeemed her, and she became part of the lineage of Jesus. Just like her, you and I were without a Savior, without hope, until Jesus came into our lives and became our Kinsman Redeemer. We were sitting in darkness, afar from God. He saved us from a fate worse than death and we became His bride, with full rights, access, and privileges. Naomi is a picture of Israel, as you learned in another portion of this series. The women surrounding her depict the nations of the world after Jesus returns to set everything right again. Israel, at last, will be queen among the nations, as she was always meant to be. The women who are gathered around her in admiration of her son are the nations of the world. 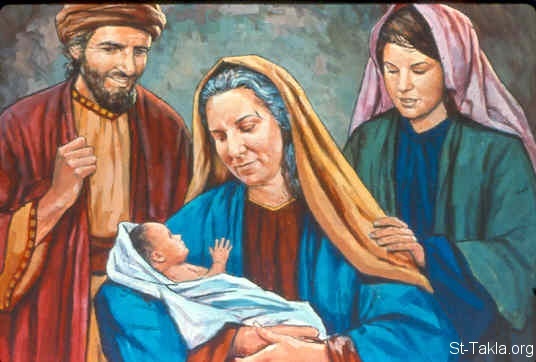 The “Women” are admiring her beautiful son Who was born into this world as a Jew. Boaz is a type that leads into another type. He is a type of Christ as our Kinsman Redeemer. 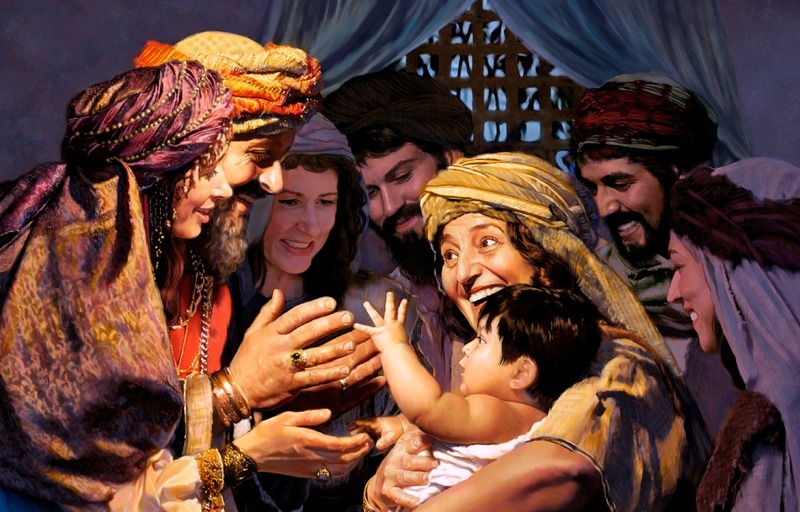 His son is a picture of the babe Who would be born in the distant future in this very same town of Bethlehem; The One Who would come and save the whole world. The babe held by Naomi is, of course, a picture of Jesus. He will be admired by all the nations after He returns to earth. But he also is another type. Notice that his name, “Obed,” was not given to him by his mother but by the women around Naomi. Obed in Hebrew means, “Servant.” That’s Jesus! He came not to be served, but to serve. 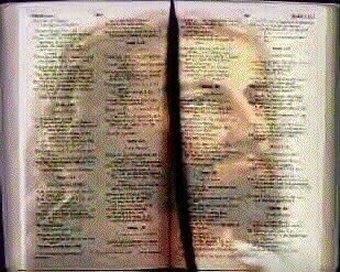 Final Hidden Message In Hebrew Names. Last but not least, there is a wonderful message to us at the very end of this beautiful story. Whenever a story ends like this, documenting the lineage of Jesus, there is something special hidden in the meanings of names for us to find. Let’s look closely at the meaning of each name in this verse. Perez…………….Breach. Breach means “break. Breaks in the wall can let sheep out and/or wolves in. Why miracles in His garment? This refers to the only woman, (a picture of the Church), who touched the hem of His GARMENT and the 12-year, life-threatening, bleeding condition with which she had been afflicted was immediately healed! What a God! What a Savior! God SO lovedthe world that He gave His only begotten Son; that whosoever believes in Him shall NOT perish, but have eternal life! And what a wonderful Daddy to give us this beautiful message in the amazing story of Ruth. ← Boaz Marries Ruth: The Story of Ruth Part 10 of 11.